adbLink 3.9 is a companion program for Kodi. adbLink The Kodi Companion. Available for Windows, Mac & Linux. Utility menu/Program start: Window title corrected. Google+ support links removed. Google+ is EOL 4/2/19. Windows 7: Console didn't open for some users. Fixed. storage lacks an Android/data/ file structure. Fixed. screensaver timers off or set timers to custom value. Log file location for Windows incorrect: Fixed. Kodi restore for hosts (Windows/Mac/Linux) removed. Restore is now only functional for Android devices. required by adbLink for Windows. icons folder added to linux adbfiles directory. adbLink update checking routine updated. now properly resets when job is done. directory change via go button. Labeling system for long running processes modified. Forum and WIKI Help links updated. Utility menu function added: Re-install Busybox. Help menu item added for Re-install Busybox. the device OS isn't Android. the global default pull directory in in preferences. checking this box. See help for more detail on this. or see help topic "Shortcuts". Shortcut topic added to help. shortcuts for main screen buttons. Note: adbLink 3.1 has been pulled. If you installed it, please update to v3.2 or drop back to 3.0.
partitions if your device is rooted. with adbLink 2.04 and up. now run adbLink without admin privileges. The progress bar activity indicator is back. a device record. In this case, Kodi defaults are assumed. now a preference, with normal set as default. devices to PC/Mac or from PC/Mac to Android device. running, blue when the job queue is empty. but just ran until closed by a process ending. been entered into the adbLink database. Easy edit of Kodi XML files on any platform. Local IP address reported in log file. Menu function: Kodi Data Usage added. Shows amount of space used by Kodi data. database and log files will be erased. Kodi 17 cache xml settings added. Help files for various new functions added. make busybox applets available to ADB shell. Bug condition in busybox installation fixed. Screen capture function restored. See help. "Device Unauthorized" help file added. Kodi partiton value initialzed for new devices. Routine added to detect Amazon OS5. Routine added to identify Amazon/Nvidia devices. SELinux set to permissive with external drive mounts. SELinux set to Enforcing after external drive umounts. At boot options require a rom with configurable startup script. XBMC preset removed from device setup. Google adb for Windows/OSX/Linux updated to 1.0.32. TV has been replaced by Tubi TV. Docs/Icons/filepaths updated. new specifications from TVMC development team. USB mode tested with Fire TV. [email protected] for the fix. to put advancedsettings.xml in extUsb if required. Backup routine fixed to allow for relocated Thumbnails. if a USB connection is made manually at the adbLink console. Busybox added for non-root users. Tooltips added to share mounting dialog. SSH/SFTP html help files updated. has embedded spaces is fixed. Bug allowing empty 04mntshares script fixed. Existence check for pull directory added. TVMC added to media center presets in setup dialog. TVMC added to Llama options. the SPMC icon in the FTV's Recent area. "No update available" to "No adbLink update available"
Various typos in html help fixed. Mount USB drives at boot checkbox moved to Device Setup. mount & /data swap scripts and offers to restore them. installation. System tools is a prerequisite. rbox full unlock added. Currently, the unlock cannot be reversed. checked/unchecked by the user. Nothing automatic occurs. Main window combobox now contains device description, not IP. or /file/.xbmc/ file path, e.g. SPMC. Device Setup Help re-written to reflect new layout. Root requirement to check Kodi running state removed. Backups made by the Kodi Backup Addon can be restored by adbLink. Main window "Setup" button now reads "Device Setup"
adbLink now attempts connection with first device at startup. Llama Options for XBMC/Kodi on boot simplified. "Backup Kodi" button now reads "Backup"
"Restore Kodi" button now reads "Restore"
LLama Options "Boot AFTV to Kodi" replaces "Kodi" with "Media Center"
Llama Options "Link Kodi to ikonoTV" replaces "Kodi" with "Media Center"
Bug in aftv-unlock detection fixed. Check for enduser-added spaces in app filename. Fixed bug in root detection function. Help Selection: "Preferences Dialog" changed to "Device Setup"
Menu option "Preferences" changed to "Device Setup"
aftv-unlock detection. Warns if program isn't installed. Linux x-terminal-emulator changed to gnome-terminal. Mount CIFS/NFS shares ad hoc or at boot. videos showing various adbLink functions in action. for Kodi you need, not limited to a few presets. init scripts required by adbLink. Minor bugs fixed as found. Kodi is now chosen by default. Various minor bugs fixed, forms adjusted, etc. Swap /data to external drive added. External drive mounting via UUID added. All XBMC options are now non-root. now included for Windows users. Llama dialog options fixed to work with non-root users. Clockwork Mod Recovery updated to 6.0.5.1.2. Scripting at boot changed to init.d system. Windows adb shell keyboard bug fixed. functions, Root menu contains root-only functions. due to geographic restrictions. Classic TV is only available in the US. rather than depending on a database field. Database fields for USB drive persistence and Amazon Updates removed. Linux bug installed apks not displayed in uninstall dialog fixed. Firmware installaton recovery directory not found bug fixed. are now included with adbLink 1.08 with permission from rbox. Help re-written for firmware and recovery installation. Linux bug for file selection on usb devices fixed. Support for CWM recovery installation added. and XP. Shortcuts to adbLink.exe work as expected. in addition to the adbLink.exe program. check mounting to be persistent. and clients on the network. Credits and links provided for all helper programs. you wish, as long as the adbfiles folder is installed there also. kept. This folder holds adb.exe, scripts and various other files. folder, but it's inside the adbLink.app bundle. 3. Both of the above. included. This can also be reversed, restoring the Default Classic TV icon. "updates disabled/enabled" pop-up dialog is suppressed. the adbLink page to download the new version if desired. Preferences also has a "Check for updates" button. A dedicated button to change the XBMC splash screen has been added. topics where adbLink is supported, xda and xbmc. version number changed to constant. Extensive log file now produced after each run. XBMC restore bug fixed (restore prevented when XBMC running). Code calling external processes refactored for greater efficiency. Busybox install bug fixed (post-install file cleanup). Busybox uninstall bug fixed (post-uninstall file cleanup). USB unmounting tuned for multiple drives. Firmware install searches all /storage/usb/sd* for .bin and .zip files. USB Firmware install, Pull and Delete dialogs now utilize a file browser. Help system updated to reflect changes. I need help connecting to my FireTV using adblink. I have tried everything I know. I have Kodi 15.1 installed, but want to update to the most recent version. I also want to be able to connect an external hard drive to my firetv and play movies directly from it. I can stream movies over my network, but can't get adblink to connect. I have tried all suggestions. Rebooted everything, verified the IP address, allowed adblink through my firewall. I get a request timeout when I try to ping the AFTV IP address. I used to be able to connect to it using adbfire with windows 7. I now have windows 10. SELECT Id FROM device WHERE description="FireTV"
SELECT daddr FROM device WHERE description="FireTV"
SELECT Id FROM device WHERE description=""
SELECT daddr FROM device WHERE description=""
Quote: I get a request timeout when I try to ping the AFTV IP address. unless you are connecting via USB. You should re-check your IP address. As far as connecting a hard drive goes, your best bet is stickmount. adbLink's had drive connection is only usable by root, Kodi can't see it due to Android sandboxing. Thank you for your reply. I have triple checked my IP address. I don't understand how I am able to stream movies over my network but cannot connect via adblink. (2016-06-12, 19:31)tfwise Wrote: Thank you for your reply. I have triple checked my IP address. I don't understand how I am able to stream movies over my network but cannot connect via adblink. adbLink is a "front-end" for the command-line adb.exe program. What it does is build command strings and pass them to the adb.exe program, provided by Google. adb.exe (Android Debug Bridge) must have a path to your device in order to connect. If you can't ping your device, you don't have a network path. This isn't an adb/adbLink problem, it's an issue with your network. There could be dozens of reasons why you can't ping your device, the first thing I'd check is your device subnet. The AFTV IP subnet in your log is 192.168.1; Check your computer's IP and make sure the subnet matches, i.e. it should be 192.168.1 as well. You may want to reboot your router and device and see if that helps. why can i no longer find the screenshot button in adblink since name change? (2016-07-09, 14:27)drizzt09 Wrote: why can i no longer find the screenshot button in adblink since name change? Error on my part. The function returns in 2.05. Whenever I back up Kodi using adb it won't back up the temp folder, so when I reinstall on another device all addons go over but the set up doesn't. What "set up" are you referring to? adbLink backs up Kodi using the "adb pull" command, which backs up temp w/o issue here. Its my own set up, when I use 'Back Up' it will back up media, addons, user data but not the temp filder. When I restore it will just restore the plain Kodi skin and my addons are only available by clicking on addons, so no menu how I set it, no background images what I set, no sub menus that I set. Tried on my deaktop and my laptop. OK, I think I understand your problem now. 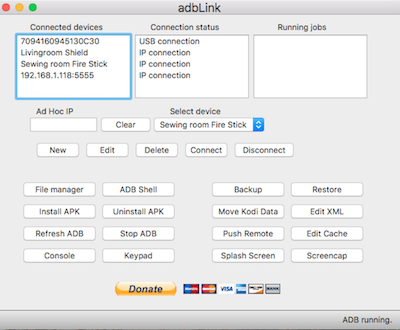 adbLink backs up Kodi by doing an "adb pull" on /files/.kodi which copies all files underneath /files/.kodi to the backup location you choose. This includes all non-empty top-level folders (userdata, addons,temp,etc) and subfolders. Why this isn't working in your case I don't know, so I'll need to clone your setup to see if I can spot the problem. (2016-07-24, 20:37)jocala Wrote: What "set up" are you referring to? adbLink backs up Kodi using the "adb pull" command, which backs up temp w/o issue here. Thank you, I will send you an email, what details do you need? (2016-07-24, 23:03)ashjf Wrote: Its my own set up, when I use 'Back Up' it will back up media, addons, user data but not the temp filder. Everything you installed on top of stock Kodi.